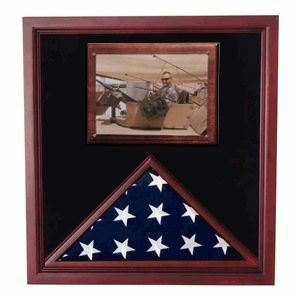 The Army Air Force Large flag and Photo case Will holed the Burial flag and a Photo. This flag case is one of the best flag cases, It si all Hand made By American Veterans. that case can fit for a 3x5 flag. Or we have the option to make the case bigger - so it will fit the Large Flag ( a 5x9.5) flag. The flag that was over the casket is a 5x9.5 flag, and when folded it will maser from the right bottom corner to the left bottom corner about 22-24 inches ( depends how strong the flag was folded ). This beautiful Cherry Flag and Photo Case will hold a 5 x 9.5 flag or 3' x 5' flag in the flag case and a 8 1/2" x 11" Photo in the Photo holder. It has a Plexi glass front and black lining for an elegant touch. and it is 30 3/4" x 26" x 3". This beautiful Cherry Flag and Photo Case will hold a 5x9.5 flag as well as 3' x 5' flag in the flag case and a 8 1/2" x 11" Photo in the Photo holder. It has a Plexi glass front and black lining for an elegant touch. The backboard around the two interior cases is perfect for hanging medals and other memorabilia. We can fit that case for verity of flags Please chose the size of flag that you have on the right side. It can fit for 3x5 flag. It can fit for 4x6 Flag. It can fit for 5x8 flag. and 5x9.5 Flag ( the flag that was over the casket in a military funeral ).